This is a review of the supplement Therapy-G Hair Vitamins. The company’s product claims to aid in the growth of natural, healthy hair. They also suggest that this product can improve the speed of your hair growth, in addition to aiding new growth in areas suffering from hair loss. Therapy-G also claims that their Hair Vitamins can return your hair to its young, elastic state. Read on to find out more about this product & find out if it’s the right product for you. From what we could find on Therapy-G web site, individuals are meant to take two pills daily, with food. After an extensive search of the company’s home page, we found that it is suggests individuals wait between 6 to 8 weeks before attempting to see any noticeable effects from this supplement. Therapy-G’s Hair Vitamins are an herbal supplement, so individuals under the age of 18 should consult a physician before consumption, and in fact, it is recommended that ANY individual should consult with a physician before starting a new vitamin regimen. From the information Therapy-G provides, it seems that their Hair Vitamins contain an overwhelming amount of compounds that contribute to both hair growth, and general physical well-being. This is a potent vitamin that contains 100% of your daily needs of every active ingredient. 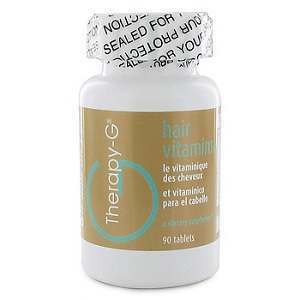 A single order of Therapy-G Hair Vitamins costs $35.00 for a 45-day supply. Therapy-G sells this product through their website. However, upon examination no discounts or subscription programs could be found anywhere on the site, save for shipping discounts on any order over $60 in the continental United States. Therapy-G does market and sell its own products, and because of this, they’re able to offer a 90-day guarantee (good for either a full refund or exchange). Customers are responsible for return shipping costs. The contact information, and specifics of Therapy-G’s guarantee are easily found on the company’s website. Therapy-G Hair Vitamins seem to be a fabulous product for those individuals in need of a dependable hair growth solution. For what you receive, Therapy-G Hair Vitamins are a relatively cheap product, especially for the quantity received per bottle (90 pills). Another plus is that this product actually supplies your recommended daily values of several vitamins and minerals essential to human health, something not seen in many of Therapy-G’s competitors. Unfortunately, no reviews could be found, either on the company’s website, or on secondary seller sites. Another downside is the lack of any sort of studies or scientific data to back up this product, although again, it does contain several tried and true compounds that are claimed to be essential for general health and well-being. John Brownstone	reviewed Therapy-G Hair Vitamins	on June 28th	 and gave it a rating of 3.5.